1. Since 31 December 2011. 2. Since 7 September 2009. The Independent State of Samoa is a country in Pacific Ocean. It became independent from New Zealand in 1962. It has nine islands. The capital of Samoa is Apia. It is on the island of Upolu. The head of the country is Malietoa Tanumafili II. The languages spoken in Samoa include Samoan and English. The sport that is most popular in Samoa is Rugby, and many Samoan people play Rugby. Samoa was admitted to the United Nations on 15 December 1976. Samoa has eleven political districts. These are called itūmālō. These are the traditional eleven districts that were made well before European arrival. View of Falefa Valley from Le Mafa Pass, east Upolu. The two large islands of Upolu and Savai'i are 99% of the total land area. There are eight small islets. These are the three islets in the Apolima Strait: Manono Island, Apolima and Nu'ulopa. There are four Aleipata Islands off the eastern end of Upolu. They are: Nu'utele, Nu'ulua, Namua, and Fanuatapu. And there is Nu'usafe'e. 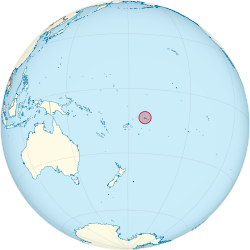 East of Samoa is a group of islands called American Samoa. They are part of the United States, but they are similar to the country Samoa, because they also speak Samoan. Samoa used to be east of the international date line. In 2011, the line changed, so that Samoa would be to the west of the date line. This change took effect on the night of 29 December. Friday was skipped altogether and the following day was Saturday 31 December. Samoa has 194,320 people. 92.6% are Samoans, 7% Euronesians (people of mixed, European and Polynesian ancestors) and 0.4% are Europeans. Religion in Samoa includes the following: Christian Congregational Church of Samoa 35.5%, Roman Catholic 19.6%, Methodist 15%, Latter-day Saints 12.7%, Samoan Assemblies of God 10.6%, Seventh-day Adventist 3.5%, Worship Centre 1.3%, unspecified 0.8%. Samoa has one of seven Bahá'í Houses of Worship in the world. It is in Tiapapata. Many people say that Samoan people are related to Māori people because lots of the language words are very similar to Maori language. As with other Polynesian cultures (Hawai'ian, Tahitian and Māori), Samoans have two gender specific and culturally important tattoos. For males, it is called the Pe'a, It is intricate and geometrical patterns tattooed on areas from the knees up towards the ribs. A male who has such a tatau is called a soga'imiti. A Samoan girl or teine is given a malu. It covers the area from just below her knees to her upper thighs. ↑ New Zealand Ministry for Culture and Heritage (19 July 2010). "Towards independence - NZ in Samoa". nzhistory.net.nz. http://www.nzhistory.net.nz/politics/samoa/towards-independence. Retrieved 29 April 2011. ↑ "CIA - The World Factbook". cia.gov. 2012. https://www.cia.gov/library/publications/the-world-factbook/geos/ws.html. Retrieved 9 August 2012. ↑ 3.0 3.1 3.2 3.3 "Samoa". International Monetary Fund. http://www.imf.org/external/pubs/ft/weo/2012/01/weodata/weorept.aspx?pr.x=66&pr.y=14&sy=2009&ey=2012&scsm=1&ssd=1&sort=country&ds=.&br=1&c=862&s=NGDPD%2CNGDPDPC%2CPPPGDP%2CPPPPC%2CLP&grp=0&a=. Retrieved 20 April 2012. ↑ Staff/Agencies (31 December 2011). "Samoa skips Friday in time zone change". ABC Australia. Archived from the original on 16 January 2012. http://www.webcitation.org/64jx2ob6X. Retrieved 16 January 2012. ↑ Chang, Richard S. (8 September 2009). "In Samoa, Drivers Switch to Left Side of the Road". The New York Times. http://wheels.blogs.nytimes.com/2009/09/08/in-samoa-drivers-switch-to-left-side-of-the-road/. Retrieved 23 May 2010. ↑ "List of Member States: S". United Nations. http://www.un.org/members/list.shtml. Retrieved 27 November 2007. ↑ "Samoa moves into tomorrow". Stuff.co.nz. 7 May 2011. http://www.stuff.co.nz/world/south-pacific/4974902/Samoa-moves-into-tomorrow. Retrieved 7 November 2011. ↑ "Samoans set to time travel". nzherald.co.nz. 29 December 2011. http://www.nzherald.co.nz/world/news/article.cfm?c_id=2&objectid=10775783. Retrieved 28 December 2011. ↑ "Samoa: People; Religions". CIA World Factbook. https://www.cia.gov/library/publications/the-world-factbook/geos/ws.html#People. Retrieved 26 November 2007. ↑ "Worn With Pride > Tatau (Tatoo)". Oceanside Museum of Art. http://www.oma-online.org/worn_with_pride_04.html. Retrieved 26 November 2007. This page was last changed on 14 July 2013, at 09:23.